Tell me about your PC gaming "Level"
I'm looking to see if anybody out there has any experience of modding any games - especially any FIFA or NBA games. I am trying to sort out modding Rugby 2005, but I am having some big problems with exporting the kits back into the game. experienced graphic designer. have all team logos etc. will make perfect replicas of official kits if anybody can extract them from the root file. ive done plenty of pes4 modding! i dont know wat tools ea games use though?? No game modding experience, but professional developer. Note : EAGraph works with Rugby05. data_pc.gob contains the kits. what's your CV like Darhf? what do you mean? are their bmp images as in 2001 uncompressed in a visible folder or do you have to 'unzip' it or something to that effect? not at all just wondering what games you have worked on? Well, the FIFA engine and EAsports game in general uses custom file formats called BIG files. There are tools to read throught theses files but they are most of the time game-specific, except for a select few, like EAGraph which seems to be able to explore throught the file. Yes, you have to do some kind of unzipping to modify these files. Like i said earlier, I have no experience in the field and I'm just trying. The files have no descriptor and there are lots of them. An update on the modding thing. I succesfully extracted some data files with EAGraph and bigGUI. I was able to export a fsh graphics file (title screens), export, modify and reinject a screen in it with fshEd. I replaced the modified file with bigGui, but nothing seems to be changed in the game. I'll investigate further when I'll have some time. If you use something like Filemon, you can see that the .exe looks for certain files in EA Sports Rugby 2005 folder, and then if it can't find it, looks in the data_pc.gob. All that needs doing is extracting that file, editing it and putting it into the EA Sports Rugby 2005 folder. That is how i did the Will Greenwood thing. However, when I tried to replace the kits it made the game crash. The faces are in a .big file inside the gob file, whereas the kits are just an .fsh file. I just can't get it to stop crashing when putting .fsh files there. Fifa 2005 has a program written called KitRaptor, which I presume actually puts the edited files back into the archive file itself. 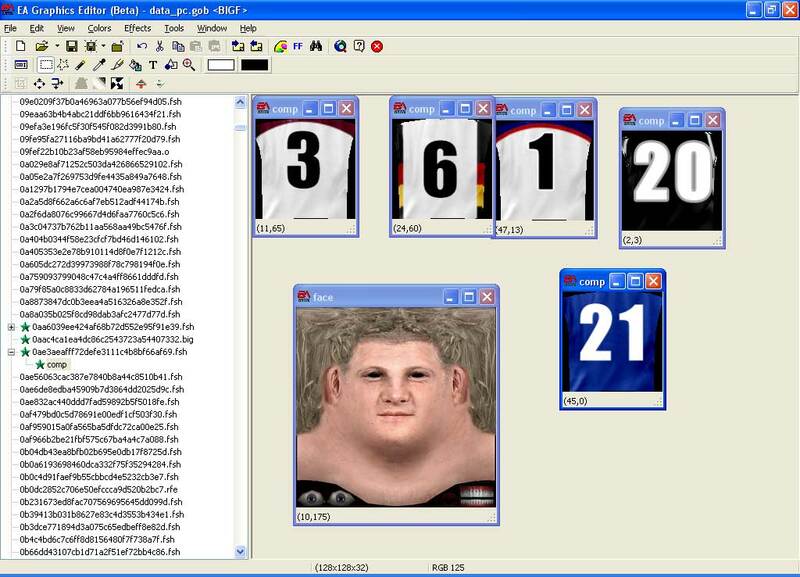 The fact that KitRaptor exists suggests to me that for kits, it is more complicated than just putting the .fsh file in the EA Sports Rugby 2005 directory. For those interested, I have worked on modding Cricket 2002, Rugby 2001, and Cricket 2004. With Cricket 2004, I was the person who worked out HB Studios custom graphics format, in order to edit kits.